Israeli forces on Friday killed six Palestinians, including at least two teenagers, who were taking part in a demonstration along the Gaza border. Hundreds of protesters were gathered there in solidarity with Palestinians residing in the West Bank, where a spate of violence in recent weeks has added to fears of growing unrest. An Israeli army spokesperson said there were 200 demonstrators, and that “Forces on the site responded with fire toward the main instigators to prevent their progress and disperse the riot.” According to the army, the protesters were throwing rocks and rolling burning tires toward the military forces. 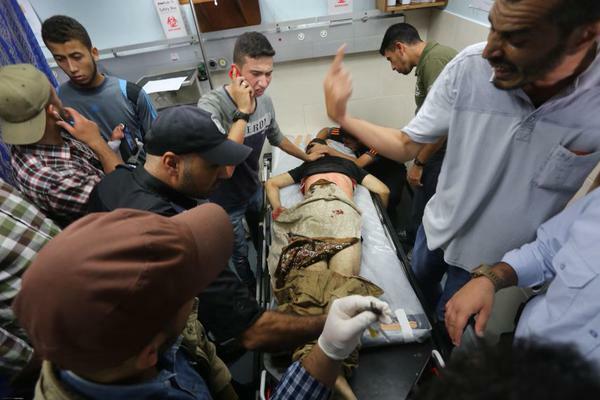 “The Israeli army uses snipers, and most of the wounds are in the head and throat,” Haaretz reports Dr. Ashraf Al-Qudra, a spokesperson for the Palestinian health ministry, as saying. Friday’s violence comes as clashes have increased in frequency since Israeli security forces began to crack down on Palestinian worshipers at the Al-Aqsa Mosque compound in last month. “At first they started shooting with rubber-coated steel bullets and stun grenades, then they fired live ammunition at us,” he said. High Commissioner’s Office said that since Sept. 28, in addition to the hundreds injured by tear gas and rubber bullets, at least 134 Palestinians had reportedly been injured from live ammunition used by Israeli forces. “The use of any firearms by law enforcement should be the exception, and only where less extreme means are insufficient to put a stop to an imminent threat of death or serious injury,” Al Hussein stated. This entry was posted in Civil Rights, Government, Homeless, Human Rights, International Agreements, Media Issues, Military, National Security vs Police State, Terrorism, War Crimes and tagged Atrocities, Civil Rights, Gaza, Gaza Strip, Gaza War, Human rights, International Agreements, Israel, Palestine, Security, War Crimes on October 10, 2015 by ew.